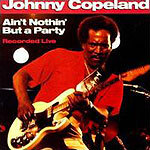 CD review: "Ain't Nothin' But a Party"
Veteran guitarist/singer Johnny Copeland finally attracted national attention two years ago when Showdown!, an album he did with the infinitely more famous Albert Collins and Robert Cray, won a Grammy. Continuing that excellence, Copeland's most recent release comes pretty darn close to capturing the felling of a live blues show. The spontaneity and energy have somehow made it past the producers and onto the vinyl. His slow, simmering cover of "Baby Please Don't Go" seems to leap off the turntable and into your living room, and Copeland has plenty of room to stretch out for long, meandering solos. On "Big Time," pianist Ken Vangel almost steals the show until Copeland steps forward with a searing solo that shows how he matched Collins fret for fret on "Showdown! ".